Once again the Appliance Hunter has been out scouring the lands, this time going through fields of ash trying to find the best ash vacuum cleaner. And he succeeded once again! I’ve found that there are loads of great ash vacuums available so I’ve reviewed some of the best ones available on Amazon so you can order yours today. I’ve got a quick summary below which you can check out and then more info further on for those who want it. An important question since you don’t want to accidentally set your ash vacuum on fire! Most ash vacuums are designed for cold ashes, so you have to let the fire cool overnight and sometimes into the day before you vacuum it. Not a huge problem, even if you use the fire every day you can just vacuum it before you light it and it should be cool enough. Hot ash vacuum, on the other hand, are designed to handle hot ashes, but this normally means up to about 50 degrees Celsius. So please don’t try and vacuum up ashes while they’re still on fire! 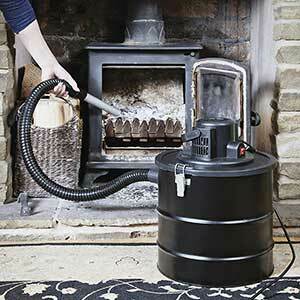 Unsurprisingly you can use your ash vacuum pretty much anywhere that ashes are! So you can use it on the BBQ, a fire pit, wood burning stove, coal fire, and some you can even clean the bottom of your chimney. But I wouldn’t recommend cleaning the chimney just in case, always get a professional chimney sweep to do it. A chimney fire isn’t worth it. But the fire underneath is way easier to clean with an ash vacuum. The Best Ash Vacuums have some sort of filter and preferably a HEPA filter. 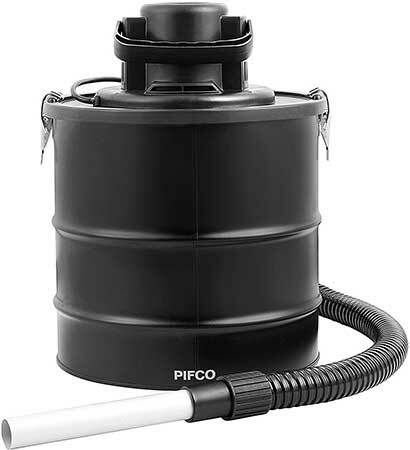 A HEPA filter helps get rid of all the tiny particles that can sometimes be blown back out of the vacuum while it’s sucking everything in. So it avoids any dust clouds getting spat back out at you while you’re trying to clean. Well in Ash Vacuums it does matter a little but still not majorly. Unless you know you have an especially big fire pit then most standard sizes will be fine. More specifically, anywhere between 18-25L is going to be more than big enough. While smaller than that will be fine for smaller fires and barbecues, you’ll just have to empty it more often. And it’s time for the main event! I’ve gathered together and reviewed the best ash vacuum cleaners available and linked them through to Amazon so you can order yours today! Again this is a hot ash vacuum but it maybe should be called a warm ash vacuum, up to 50 Degrees Celsius. So if the fires still warm the morning after you can use it but you can’t use it on very hot ashes. Apart from that Pifco have nailed it. A nice easy to empty ash vacuum with a really powerful suction so you can get a really thorough clean while you’re using it. It’s got a filter for getting all the small dust particles which are washable so you can keep reusing it which is great. When it’s full it can get a little heavy but it’s not a huge problem and it’s really easy to empty because there’s no bag. 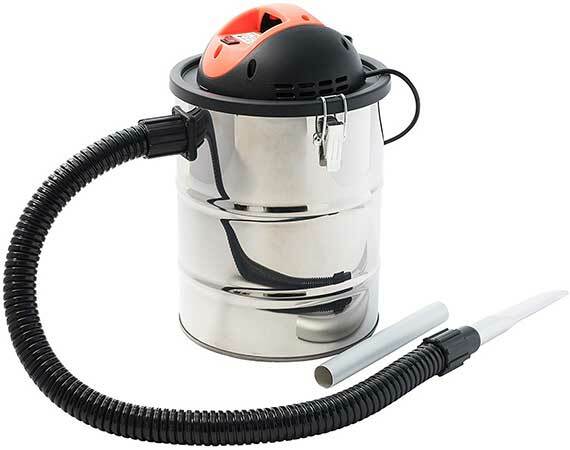 Overall, obvious why it’s the most popular ash vacuum, great price, strong suction and easy to empty. The VonHaus ash vacuum is a great vacuum cleaner. 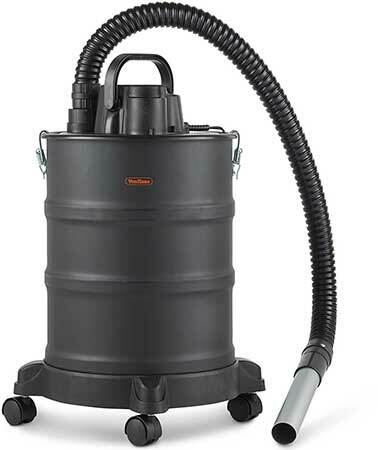 It’s available in a few different sizes but the 25L capacity is definitely the best value. One thing I really loved is that it has castor wheels! It’s such a little thing but after a few uses, it can get very full and very heavy. Especially for how bulky a shape they can be so it’s great just to have some wheels so you can wheel it out use it and wheel it back. Just don’t forget you have to pick it up to empty it, so don’t let it get too full! This has the all-important HEPA filter so it takes all the little bits and pieces out the air so you can breathe easily after you use it. Overall, a great ash vacuum, the wheels make it so much easier to move around and use. 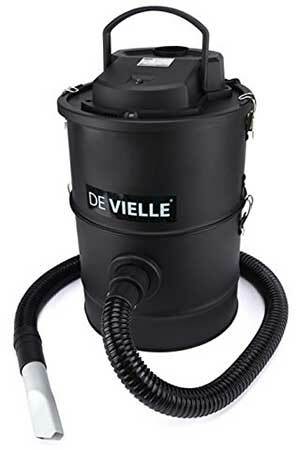 The De Vielle cold ash vacuum is another great choice. It’s hot a 3 filter system so that absolutely no ash or dust is expelled out the other end when it’s running. The power cable is a bit short at about 4m long but it’s plenty big enough for in the house. It’s just if you’re running the cable from the house out to the garden you might find it a bit annoying. The motor is 1200W so is hugely powerful which helps you get a really deep clean of whatever you happen to be cleaning. It is just a cold ash vacuum so you’ll have to wait till all the remains of the fire are nice and cold. 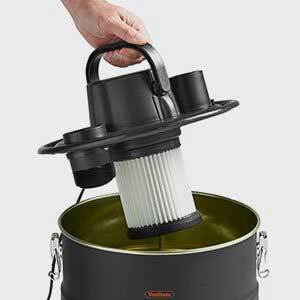 Overall, a great cold ash vacuum, filters the air really effectively. The Ovation Ash Vacuum is perfect for use in the home, it’s only got a small power cable but it’s nice and portable so you can store it easily and take it out when you need it. It’s got a 15 L capacity so you’ll need to empty it fairly regularly but it empties nice and easily so it doesn’t’ cause much of a problem. There’s a HEPA filter present so any ash gets filtered so it’s just air coming out the other end. No surprising dust clouds exploding out the back! Overall, a great choice of vacuum is you just need it in the house and you’re looking for something small to store easily.